9.11 The Notch phenotype is produced by a chromosome deletion that includes the Notch gene. 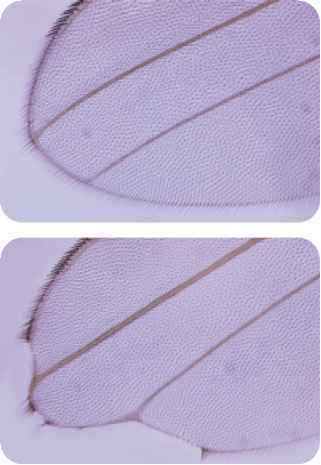 (top, normal wing veination; bottom, wing veination produced by Notch mutation. (Spyros Artavanis-Tsakonas, Kenji Matsuno, and Mark E. Fortini). the two chromosomes form an inversion loop ( FIGURE 9.12). The presence of an inversion loop in meiosis indicates that an inversion is present. The heterozygote has one normal chromosome.